I think I’m addicted to puns. I’m sorry…and yet I’m not. The Thundercats reboot really has been fantastic and I highly recommend it. It’s kind of got a Star Wars vibe to it…ya know…before it got badly “Lucas-ed”. This joke landed on me as kind of an excuse to draw my favourites. That and my house has a garden now. Garden type stuff that I can eat eventually. I really did need to hoe it at one point, so I guess that’s topical too? I’m happy to say I took the day off yesterday and spent it drawing (mostly, some video-games in there). Sadly, I never get as much as I want to get done, done. But that will always be true. Hopefully you’ll get to see more of the fruits of my labours soon. Going to check out the new series. Btw. The babe in the middel is a hottie. Need to get a HObart dishwasher too. I really need to check out this new series. I keep hearing nothing but good things about it. It’s well worth your time. The first season is nearly done (I think there’s one episode left). I thought he was calling Cheetara a ho at first. She is kinda skankily, I mean scantily, clad. She just likes to feel “free”. I want to see Liono driving a tractor! My stepson keeps pointing at his sister every time he says it. I guess we all go thru that. Good luck on the garden. I haven’t gotten the nerve (or gall?) to try one yet. My dad is the master gardener, but my green thumb is the wrong shade. Thanks! It’s just something you need to try even if it doesn’t grow right the first time. Terrible, and yet brilliant at the same time! He he, I aim to please. What is it about cats and gardens, anyway? Great art, Brandon! It’s just another place to put their dookie. 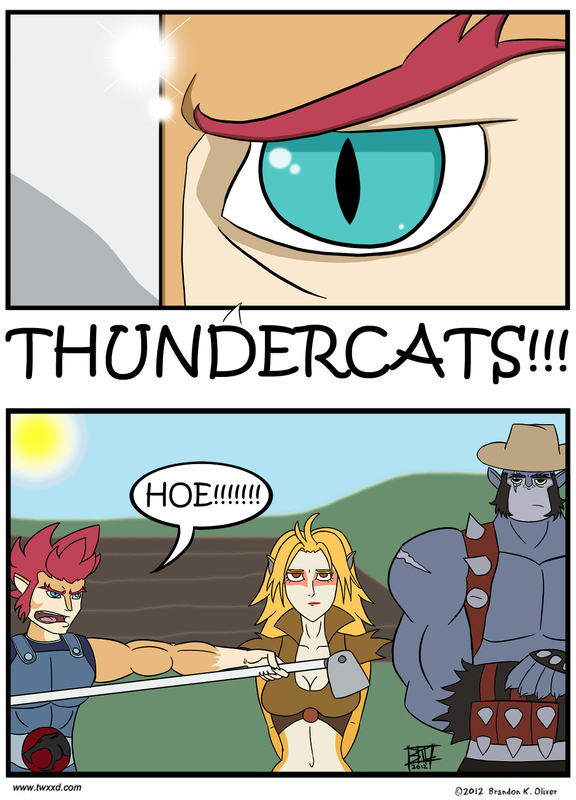 Heh, I didn’t know you liked Thundercats! That’s it, I’m gonna finish that Lion-O drawing tonight and I’m totally tweeting it to you. Love the extreme closeup. I love Thundercats :). I’m really looking forward to seeing it! Ho Ho Ho good one. I am wondering how many times she belted him with the hoe?? ?